Ontraport and Infusionsoft are the most relevant all-in-one marketing automation tools for small businesses today – they combine the power of CRM, e-Commerce, affiliate tracking and sophisticated automation, bundled into one affordable platform. Both products have their pleasure and pain points as outlined below. This comparison is the result of years of experience of working with both systems. Both systems are powerful tools that can completely revolutionize your business. They are comparable in their philosophy and approach, and both systems are being used by very prolific and successful marketers. However, today I am clearly recommending Ontraport as the best all-in-one Sales and Marketing Automation platform. Ontraport is getting better and better – quickly. Infusionsoft, despite large-scale funding and employing a huge team, is, inexplicably, just too slow to deliver what their customers need and are asking for. With Infusionsoft you require paid 3rd party apps to achieve some of the most basic tasks, like modern forms, pages, split-testing, text messaging, field math, the list goes on and on. Attempts at rolling out important features that could be considered standard, sometimes take years, if they happen at all, and when they happen they are often half-baked or 2-3 years behind their competitors (I have so many examples for that). In the past I used to recommend Infusionsoft over Ontraport for most users, simply because Infusionsoft had a visual campaign builder and Ontraport did not. From a technology and versatility standpoint Ontraport has been superior to Infusionsoft for quite a while, but – prior to the introduction of their campaign builder – it was a really hard system to configure if you weren’t a techie-geek. Then Ontraport rolled out their visual campaign builder, which is a KILLER building tool AND a killer reporting/analytics tool in ONE. In my opinion it is the best builder in the industry. And, boy, does it make Infusionsoft’s builder look sad in comparison. The visual campaign builder made such impact that it put Ontraport again on the headlines for being a Bronze winner in the prestigious Best in Biz Awards for Best New Product Feature of the Year – Enterprise/SMB category. Watching Ontraports campaign builder / campaign reporting in action made it really clear to me that Ontraport gets stuff done. They listen, they research, they care about their customers’ experience, and they are small enough yet tenacious enough to roll stuff out in short time with a really small team of motivated folks. In a nutshell, I believe that Ontraport is the more modern and more powerful system, and it offers FAR better value for your money in terms of built in functionality and feature richness. 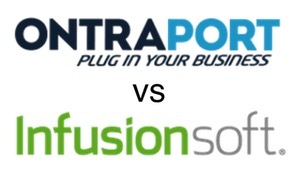 The only aspect where (in my humble opinion) Infusionsoft is stronger than Ontraport, is that it has a bigger, stronger ecosystem of 3rd party apps, integrations and consultants. This, of course, is the super short version. Please spend as much time as you like on this page, and use the detailed comparison below to form your own opinion and make a decision which of these tools is the best fit for you and your business. Your initial funds are low and you don’t want to pay for multiple 3rd party add ons. You like the cool, fresh, modern, fun vibe of this smaller, more personal, more flexible company. You sell services or products that require a “complex” sales process – i.e. multiple conversations and follow ups, quotes, proposals, product demos etc. You want a full shopping cart, and not just order forms, out-of-the-box. You feel safer with a more established brand, backed by a bigger company and some multi million dollar funding. Here is a list of the biggest “gotchas” from a daily practice point of view that will shed some light on the Ontraport vs Infusionsoft debate. The PLEASURE points are features that will delight you, turn you on, excite you and make you sing “Hallelujah” each time you realize that they are available and/or you use them. “Ontrapages” landing-page builder to create mobile responsive forms, landing pages, order pages and forms. Ontraforms mobile responsive, great looking modal forms with a wide range of display options and proper in-line validation. Built in Membership Sites functionality via WordPress plugin, to build membership areas with protected content. Visual campaign builder that makes configuring campaigns drag-and-drop easy but sadly hasn’t seen any development in many years and is quite lame compared to Ontraport’s. Campaign reporting is super rudimentary, and it is very limited in trigger and action types and manipulation of CRM data. Great Mobile App to see all contact data on the go, set tags, add tasks etc. Take mobile payments via mobile app and proprietary card reader. Opportunity Management and Sales Pipeline is an “ok” functionality add-on, but again, lags far behind Ontraport’s features. It is severely limited in automation capabilities – all you can do is trigger some follow-up automation when an opportunity is moved between stages, but no manipulation of opportunity values through automation is impossible, and inexplicably you can’t even merge opportunity data into emails, so what’s the point? Fewer reliable 3rd party apps to enhance functionality beyond the built in features. Rudimentary Zapier integration (but growing). Forms (that are not part of the new landing page builder) are a complete joke – not responsive, no in-line form validation (instead a hideous screen if you made a mistake). Completely unacceptable in this day and age. No integration with Stripe payment gateway. This is a huge annoyance if you’re located “in the (wrong) rest of the world”. Infusionsoft is offering their own easy-to-apply-for merchant gateway “Infusionsoft Payments” to customers in US, Canada, UK, Australia, at similar conditions as Stripe/Paypal BUT if you’re in ANY other country in the world you may have to jump through many hoops to get a proper merchant account that integrates with Infusionsoft. I have seen dozens of frustrated Infusionsoft clients try to get a payment gateway that works in their country, even though they already HAD Stripe. Sure, there’s a 3rd party add-on to link Infusionsoft to Stripe, but that’s another $47/mo right there, just to get a service that Ontraport provides right out of the gate. It will add up. I don’t want to completely overwhelm you. That’s why this section has been edited to show only the most important differences. The respective winning features are displayed in bold for a faster comparison. Great, flexible, freely customizable CRM, including a powerful concept for company and opportunity / deals records with many trigger types, data manipulation and merging of company/deals data into emails, text messages etc. Layout of the CRM is not customizable. Only custom fields can be rearranged on the custom tabs, which is cumbersome. Extremely convenient, integrated A/B/C/D split testing for everything – landing pages, forms, emails, postcards. No membership site functionality included. You have to invest in an add-on like Memberium (widely considered best Membership plugin for Infusionsoft by certified consultants), CustomerHub, iMember360 or Wishlist Member at a monthly fee. These tool, however, do much more than the simple Ontraport functionality. Individual and Group Coupon Codes In addition to general coupon codes (for everybody) you can also create personal custom codes dynamically, in the moment that you send out an email, a text message or a postcard, and set it to expire on either a fixed date or x amount of time after its creation. Powerful! Group codes can be limited how often they can be used. Has a shoppingcart / storefront built in, which is pretty decent but not as feature-rich as a dedicated shopping cart product like 1Shoppingcart etc. Has a rather simple, targeted up-sell function inside order forms and shopping cart (similar to the “you might also like this item – add to cart?”). Building 1-click upsells is difficult or requires a 3rd party plugin. Only group promo codes, no individual ones. Group codes can’t be limited in number of uses. Available in 4 editions: Basic, Plus, Pro and Enterprise. Free Support Screenshare and Live Chat during the following times: Mon – Thu 6am – 12am, Fri 6am – 9pm and Sat – Sun 9am – 9pm (all times in PST) – the most customer friendly times in the industry. The screenshare support is an industry-first. Screenshare sessions need to be scheduled using an online scheduler, and are often available immediately or within the hour. Free phone support (with free phone numbers in US, UK and AUS): Mon – Fri 6 AM to 7 PM (Arizona time), Live Chat 24/7, but in my experience that’s not always reliably so. Has a team of around 100 employees. Has won numerous “best workplace” awards.